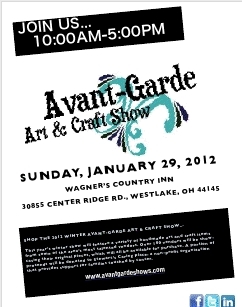 Yes, Images in Bloom will be setting up shop at the Avante Garde show today. It should be fun and my prayer is it is profitable. But I have to ask you to laugh with me at my crazyness. Confidently I packed the car up friday night, and saturday morning (yesterday) I drove out to Wagners in that lovely picturesque snowfall… only to find the building buttoned up tight. I pulled out the planner, looked at the cell phone… OMG i was a day early. I have never done that before. (and my hubby hopes I will never do that again!) Sometimes days blur together. Well, i am confident now of the plan and will be set up and waiting for patrons at 10am. If you are around, stop out and visit. I have just completed a dozen valentines day brooches of wire crochet with bead embroidery… each is a one of a kind treasure.